In Fire Emblem Heroes, you are a summoner with the ability to call forth heroic characters from the entire history of Fire Emblem. You can summon heroes by selecting the “Summon” icon along the bottom of the screen while outside of battle. 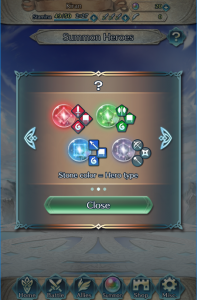 This will take you to a screen that displays the current Summoning Focus, along with the appearance rates and details of the heroes that can be summoned. 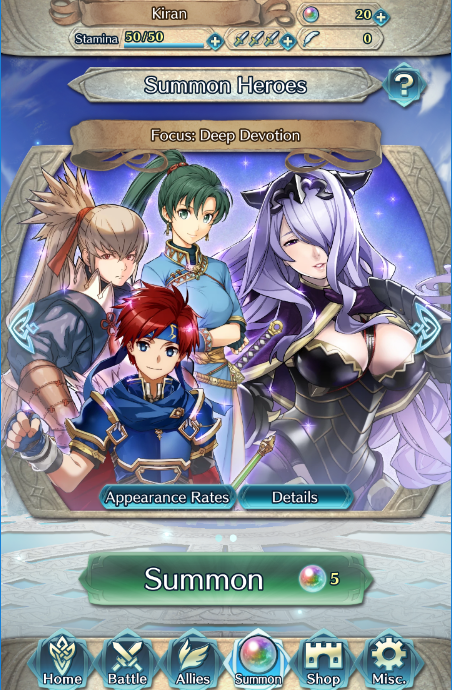 The heroes pictured in the Summoning Focus banner are known as “Focus” heroes. This means they’re slightly easier to obtain compared to other 5-Star heroes. If there are multiple Summoning Focus, you can tap the arrows along the side to switch between them. 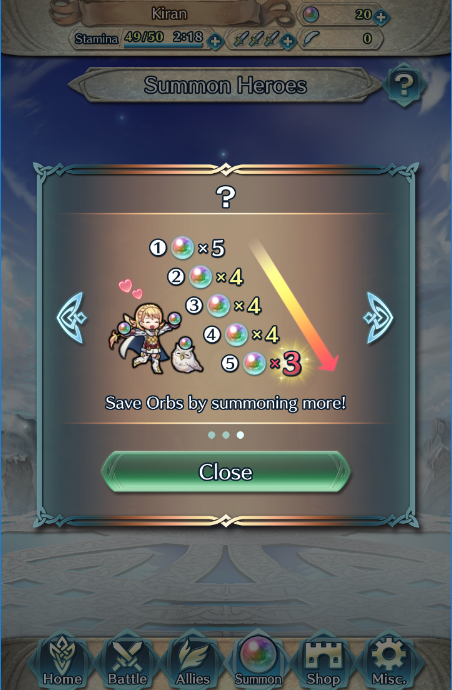 After deciding on the Summoning Focus, you will need to pay 5 Orbs upfront to begin summoning. Orbs can be earned by completing story maps or quests/missions, as a Log-in Bonus or via My Nintendo (see the Present List for details). Of course, you can also buy Orbs from the Shop. Once the summoning session begins, 5 randomly generated summoning stones will appear on screen. 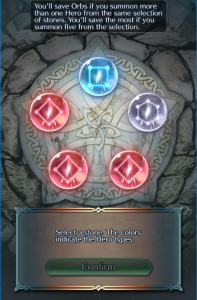 You will be prompted to select one of the stones to summon a hero. After summoning your first hero, you will be asked if you wish to continue summoning. If you continue to summon heroes during the same session, the Orb cost will be reduced. 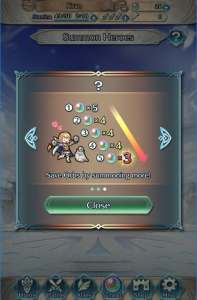 For the 2nd to 4th hero, it will cost 4 Orbs. 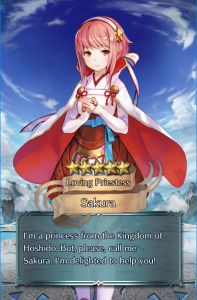 Finally, for the 5th hero, it will cost 3 Orbs. 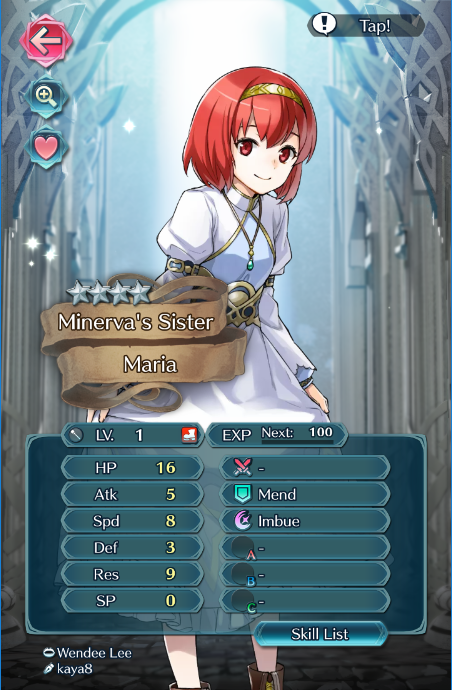 Within each rarity, the chance of obtaining a particular Hero is the same. 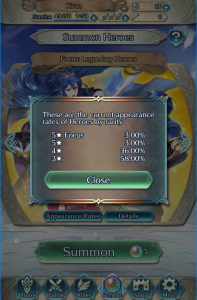 Using the Focus heroes as an example, there’s a 3% chance of obtaining a Focus hero, so if there are 4 Focus heroes, there’s a 0.75% chance of obtaining each. However this is complicated somewhat by the summoning stone colours. 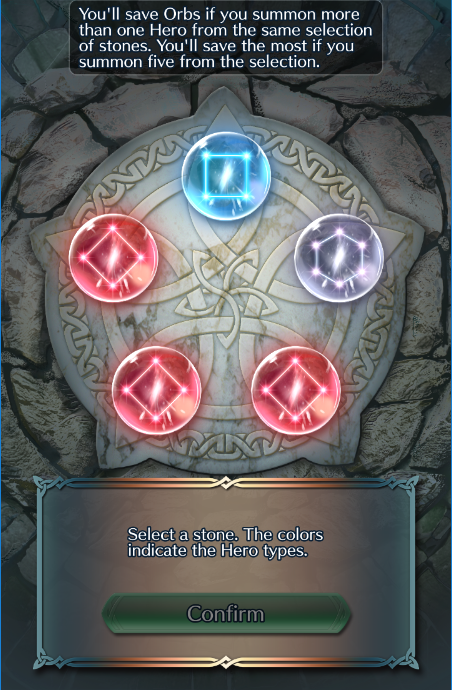 For instance, if there are no red summoning stones present, there’s a 0% chance of obtaining a red-type Hero, no matter their rarity. In general, there are two schools of thought. 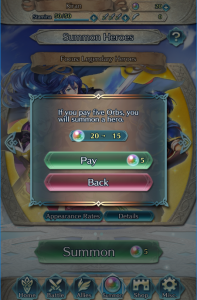 If you intend to maximise the efficiency of your Orbs and/or you need many heroes (of any kind) for your army, then it’s usually best to spend 20 Orbs at a time to summon 5 heroes in a single session. 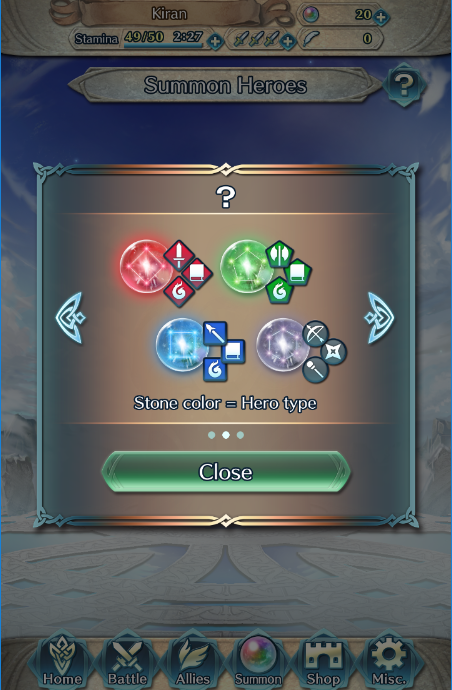 Alternatively, if you’re searching for a particular character and/or colour, you can choose to ignore summoning stones with the colour(s) you don’t want–and concentrate solely on the stones with the desired colour(s). 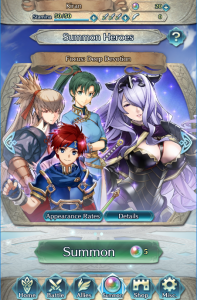 Each summoned hero will have a rarity from 3-Star to 5-Star. 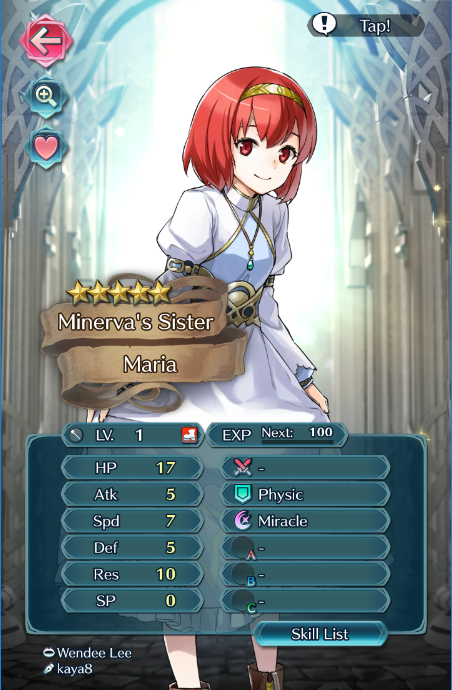 The higher the rarity, the better the hero’s stats, equipment and skills. In general, most heroes have one of two possible rarities when summoned: 3/4-Star or 4/5-Star. A small number of heroes are 5-Star only, while an even smaller number can be all three (if they are naturally 3/4-Star and appear in a Focus). Even if you own a hero with a low rarity, you can use items to increase their rarity when they are Level 20 and higher. 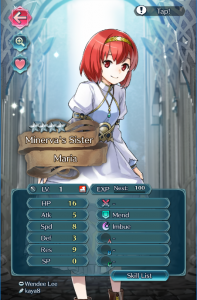 Every time a hero’s rarity is increased, their stats are reduced to the Level 1 values for that specific rarity.